After a long roller coaster ride of a recruitment, Harrison Barnes chose North Carolina. It’s over. And it’s time to move on. 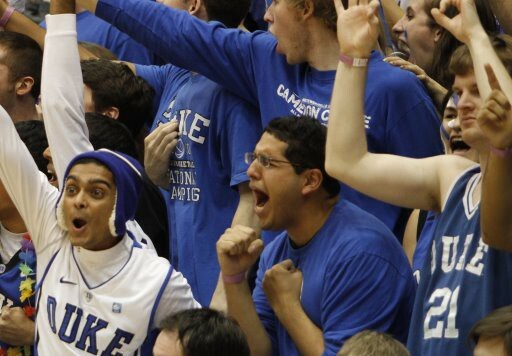 Duke fans have every right to be disappointed, angry, indignant—but there’s nothing we can do here. The good news is our committed class of 2010 is excellent. We all know about Kyrie Irving. Josh Hairston’s move to Montrose Christian is paying dividends, a storied program which will prepare him for the college ranks. Tyler Thornton is getting ready for another season in the competitive DC Catholic League, preparing to lead his Gonzaga squad to a league championship. And we have an opportunity to add to the class with the ongoing recruitment of top 30 small forward Roscoe Smith, a talented wing player from Oak Hill Academy. Roscoe is down to a final three of UConn, Duke, and Georgetown, and plans on waiting until the spring signing period to make his choice. Despite the miss on Barnes, we have an excellent group of recruiting coaches, and have a great chance at bringing Smith in. He has noted an antagonistic relationship with Barnes, and he would relish the opportunity to match up with him in the ACC. Harrison is a great player, and we wish him a long and healthy career. Check out the video below for highlights of Roscoe Smith. Enjoy. I’ve read uconn is in the lead for Roscoe. That may be true, but Roscoe will probably not make a decision until the spring, after he takes an official to Durham.